Did you know today’s Tiggerific Tuesday Trivia About The Water in the Seas with Nemo and Friends? Do you add a little salt to your meal, how about a truck load? The Seas with Nemo and Friends (formally The Living Seas) takes a lot of water and salt to keep the Friends happy. But how much, let’s take a guess. To get the water prepared how many truckloads of salt was required??? The recipe called for 27 truckloads of sodium chloride, or common table salt. Just a tad bit more than what comes on your fries. 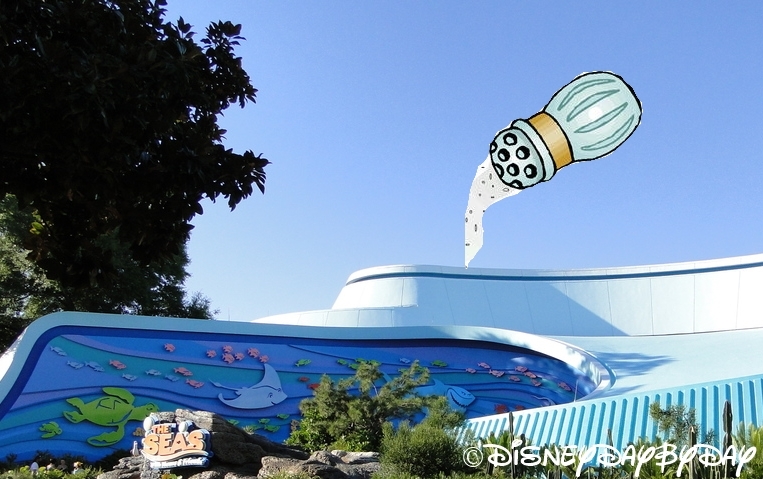 And some other fun facts, spaceship earth could fit inside the aquarium with room to spare. It is 203 feet in diameter, 27 feet deep and holds 5.7 million gallons of salt water. As you look in at the over 8,000 fish and other sea animals you are looking through 6 to 8 inches of acrylic windows. And, to keep all the friends fed they go through over two tons of food each week, yes each week. That is a LOT of salt Sean!! I love this kind of “trivial” info, thanks for sharing!! I haven’t seen the Nemo attraction for quite some time. That is a lot of salt, they must work around the clock to keep that tank clean. That is the reason I won’t let me hubby have his own fish tank. Blech! That’s a lot of salt! And I had no idea Spaceship Earth was that small in comparison to the tanks. Very interesting! Sounds like enough salt to be able to walk on water to me! Guess not, though. I’m looking forward to dining at the Coral Reef in a few weeks – it’ll be fun watching the fish swim and thinking of all that salt! Thanks for sharing. That is one big aquarium!